Coral Springs United and Football Club Prime Form Partnership | Football Club Prime Inc.
May 31, 2018, Coral Springs, FL: Today, two of south Florida’s leading soccer clubs, Coral Springs United and FC Prime, announced a partnership to align the organizations immediately and will spend the coming months finalizing a full merger. 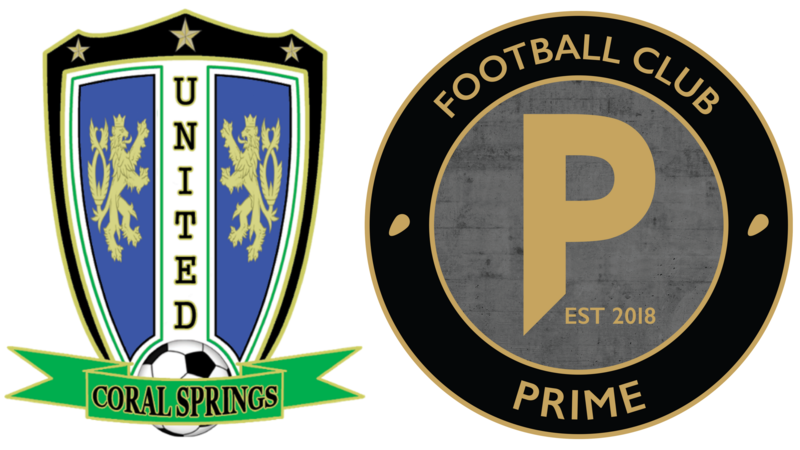 Over the past weeks, Coral Springs United and FC Prime leadership have had several meetings, sharing club philosophies and long-term vision for enhancing youth soccer and creating new opportunities for players in Broward County. The first step is combining resources and players pools at the u8-u12 ages. All junior academy teams will operate at Coral Springs except for the u11 & u12 Pre-ECNL teams that will remain at CBRP as part of the ECNL program. Paul Gregory and Daniel Tidmarsh will oversee the implementation and the structure of youth academy and Pre ECNL-program. At u13 to u19 Coral Springs and FC Prime will combine player pools to create Coral Springs Prime Showcase teams. These teams will operate out of Coral Springs under the guidance of Paul Gregory. Coral Springs United Futbol Club (CSUFC) was formed in 2011 through the merger of the Coral Springs Storm and Coral Springs Renegades Soccer Clubs. Both Clubs had competed for over 15 years in the South Florida soccer community, experiencing their own levels of success. Today Coral Springs United has over 30 competitive teams and additionally has one of the largest recreational soccer programs in the state. Football Club Prime was established with a vision to create an environment for, and to serve, players with aspirations to play at the collegiate and professional level. FC Prime currently operates in Broward and Brevard Counties and was recently admitted into the Elite Clubs National League (ECNL). “This partnership will provide our girls with a tremendous opportunity within our player development model. To be able to expose our young players to such a strong staff of coaches, players and leadership at FC Prime through the Pre-ECNL program, will serve as an outstanding platform in their long-term growth and development.” said Paul Gregory, Coral Springs Director of Coaching.